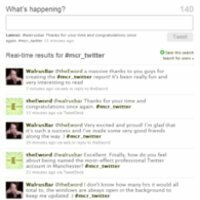 The Manchester Twitter Report ranked Walrus Bar as the most-effective company using Twitter in Manchester. theEword: First off, congratulations on being ranked in the #mcr_twitter report. theEword: When did you start running the account and what did you hope to achieve from having a Twitter presence for the bar? Walrus Bar: Initially the idea behing having a Twitter account was just to try out a new way of marketing. I wasn’t sure what to expect first but soon realised the potential of being able to directly communicate with people. theEword: Interesting. Interaction is a big part of that - what have you found to be the best way to engage with followers? Walrus Bar: I strongly believe that tweeting as a person rather than as a company has helped us reach the position we’re now in. I tweet regularly throughout the day and I try to mix all things possible in to my tweets, not just business. theEword: How do you maintain the balance between personal and professional tweets? Walrus Bar: I think it just comes naturally. It’s also down to the fact that I know the business I’m in very well. I’ve previously worked as a bartender and have a genuine interest and knowledge of the food and bar industry. theEword: Let's talk a bit about promotion: How much do you work into the account and how do you find the right balance? Walrus Bar: I don’t want it to be full of special offers and promotions everywhere so I try to balance it as much as possible. I tweet when I feel the need to let people know about the latest happening or our newest promotions. I also try to keep the promotions simple, they are very straightforward and deliver a direct message. theEword: Do you offer any competitions or offers as part of the promotion? What’s the feedback like? Walrus Bar: Yes, I do regular RT competitions for our followers where they can win a meal for two. It's always great fun as it brings out a very competitive side to people. theEword: Great! Are there any other ways to get that interaction from your followers? Walrus Bar: I take an active part as a listener as well, I get involved in discussions and tweet about recent news. Mixing a bit of work with a bit of play keeps the account “alive” and makes it more fun and interesting. theEword: One of the main pointers in the report is that an account has to offer a personality. How do you create that? Walrus Bar: It's not something you can "create" in that sense. I am genuinely interested in what people have to say and that results in a very personal twitter account. The difference with Twitter is that you HAVE to care and interact. theEword: Good advice. So, how much time do you spend on the social marketing? Walrus Bar: Twitter is with me more or less seven days a week, I also spend a lot of time on Facebook. I don't know how many hours it would all total to; the windows are always open in the background to keep me updated. theEword: Excellent. Finally, how do you feel about being named the most-effect professional Twitter account in Manchester? Walrus Bar: Very excited and proud! I’m glad that it’s such a success and I’ve made some very good friends along the way. theEword: Thanks for your time and congratulations once again. Walrus Bar: A massive thanks to you guys for creating the report! It's been really fun and very interesting to read.